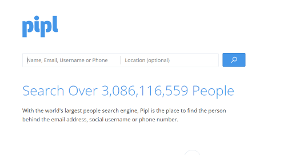 Pipl is a search engine specifically developed to help people search for other people from all over the globe. The software has many applications but it is marketed as a tool to help companies to verify identities and detect and prevent instances of financial fraud. Pipl has over three billion profiles stored in its database and all you have to do is enter a person’s information, including phone numbers, social username, and email address to pinpoint the actual person. Other applications of the software include searching business users as well as scour for more information to complete a personal profile. With Pipl, you can retrieve missing contact details so you can devise and execute more targeted and personalized marketing campaigns. Pipl is a useful people search engine when you are looking for specific types of people from anywhere in the world. This solution is quite helpful in detecting and combating financial fraud as the system helps you integrate information from various sources and pieces of data, creating a more detailed and complete profile. This enables you to determine the truthfulness of a person’s identity and assess if he or she has the potential to commit fraudulent acts. Aside from financial fraud detection, Pipl helps you get a clear picture of your customers, leads, and contacts. You can use partial information on a particular person and enter it into the system and let Pipl do the hard work of gathering all the information based on what you have from various sources – associated emails, social profiles, and other online accounts. Pipl collects all the data and gives you a full profile with all the blanks filled and all people data integrated. With Pipl, you are not only able to find phone numbers, home and business addresses, and emails. You have a platform that helps you accelerate your qualifications by enabling to create targeted campaigns using all information from your profiles. You can segment your audience with ease by retrieving their job titles and know the designation. Every organization has different needs and requires a system that can be personalized for their size, kind of employees and clients, and the particular industry they are in. For these reasons, no system can provide perfect functionality out-of-the-box. When you try to find a software product, first be sure what you require it for. Read some Pipl reviews and ask yourself do you need basic tools or do you require advanced functionality? Are there any industry-specific functionalities that you are looking for? Get the answers to these queries to assist your search. There are lots of aspects that you need to reflect on and these include your finances, particular business wants, your organization size, integration requirements etc. Take your time, check out a few free trials, and finally choose the app that offers all that you need to boost your firm effectiveness and productivity. How Much Does Pipl Cost? We realize that when you make a decision to buy Financial Reporting Software it’s important not only to see how experts evaluate it in their reviews, but also to find out if the real people and companies that buy it are actually satisfied with the product. That’s why we’ve created our behavior-based Customer Satisfaction Algorithm™ that gathers customer reviews, comments and Pipl reviews across a wide range of social media sites. The data is then presented in an easy to digest form showing how many people had positive and negative experience with Pipl. With that information at hand you should be equipped to make an informed buying decision that you won’t regret. What are Pipl pricing details? What integrations are available for Pipl? If you need more information about Pipl or you simply have a question let us know what you need and we’ll forward your request directly to the vendor.